David Little of The Little Organic Farm in Petaluma, Calif. first began farming to help some childhood friends nearly 20 years ago. He had been working as a contractor and hated it so when his buddies inherited a couple ranches he jumped at the chance to head for the country and try something new. He stayed on for about a year before striking out on his own with a few acres of potatoes. Today, Little farms over 60 acres of land in plots scattered around Marin and Petaluma. “We’re not here to be part of some big local food movement. We are just here to feed people with organic food—the way it used to be,” Little said. With no background in farming, Little looked to older generations for guidance. He spent time at the local bars just talking with old-timers, who proved more than willing to share stories from their farming days. He learned that the region had a rich potato farming history that dated back to the Gold Rush. While many farmers today utilize extensive irrigation systems, he wanted to employ the same dry-farming techniques that generations past had relied upon. Since, he has discovered that dry-farming produces exceptionally flavorful crops that have earned a reputation among some of the finest chefs in the country. Potatoes seemed a natural first crop for Little, but once he had his spuds in the ground, a fellow farmer suggested he try tomatoes as well. From the start, he was determined to dry-farm the potatoes even though he was skeptical that the tomatoes could survive without additional water. So, he hooked a water tank to the back of his old truck and started hand watering a few-hundred tomato plants. When his truck broke down, the tomatoes started to wilt, as he had expected. However, when he finally got the truck running again and returned to the field to water them, he was surprised to see that the plants were coming back. On a whim, he decided not to water them and see how they would fair without irrigation. He ended up with some of the most delicious tomatoes that he had ever tasted, he said. From then on, he has grown tomatoes with dry-farming techniques. Little starts plowing the fields as early in spring as possible while the ground is still wet from the rainy winter, usually around March. He folds organic matter into the soil then lets it sit for a few weeks so that it can start to decompose before churning the topsoil again several times with a disk plow. Then he passes a roller over the field, which breaks up the clods and seals the surface of the soil. The result is a rich spongy soil topped with a crust that prevents evaporation and traps the moisture in the soil. Then the soil is ready for planting. Dry farmed plants do not grow quite as large as irrigated crops and produce a much smaller yield. 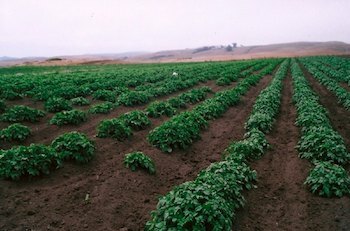 While irrigated potato fields can yield around 30 pounds of produce per acre, Little’s harvests just 7 to 10 pounds of potatoes per acre. However, Little says that what his plants lack in volume they make up for in intensity of flavor. That flavor has earned him a mention in the French Laundry Purveyor Book and on the “Martha Stewart Living.” “The really good chefs know that it’s not just their cooking that makes their food so good; it’s the products that they are cooking,” Little said. Those chefs are willing to pay a high price for flavorful produce. Over the years, Little has expanded the number of crops as he has rented additional plots of land. Some along the coast are irrigated, but many are still dry farmed. He now offers purple cauliflower, three kinds of broccoli, four different types of kales, several colors of chard, onions, beets, celeriac, rutabaga, cucumbers, and zucchini. While Little has seen a great deal of success, he has encountered many challenges. His first year of farming was rife with turmoil. He started with very little money and had to borrow money along the way. Breaking into the market in the beginning was difficult. “The system is set up for bigger farms…the Berkeley farmer’s market has three of the biggest farms in Northern California. That’s good for the community, but the small farms trying to break into markets are struggling and don’t make any money,” he said. Until a few years ago, he rented all 60 acres of land. In 2009, he purchased a house and two acres. He still rents an additional 58 acres and expects that he will have to pass his mortgage down to his children. Finding help on the farm has been difficult as well. His two kids are young adults now, but neither of them is particularly interested in farming. “It’s really hard. You get these young people that are really enthusiastic, but when you get someone good, they are so talented that they move on,” Little said. So Little continues to take things from harvest to harvest. He measures success in his ability to keep farming another year. “What’s next for me? I don’t really know. I just know that I love doing it. I’m going to die on a tractor. I just love farming so much,” he said.